This week has been a mixed one for the dollar, and by extension gold. Sentiment towards the greenback turned slightly negative in mid-week following the release of some weaker-than-expected US inflation figures. A rebound for the euro and pound, and a pause in the selling of some emerging market currencies also weighed on the dollar. However, as we head into the weekend, the dollar was making a comeback, which meant gold was falling. Benchmark government bond yields – led by the US – were on the rise again, reducing the appeal of non- and low-interest bearing assets such as gold, yen and to a lesser degree the euro. The dollar shrugged off a weaker-than-expected retail sales report on Friday, which posted its weakest gain six months in August. On a month-over-month basis, headline retail sales rose by just 0.1% instead of 0.4% expected while core sales also missed the mark with a 0.3% gain. On top of this, import prices fell unexpectedly sharply by 0.6% month-over-month. However, the dollar still managed to rise, in part because of another decent showing from industrial output. In August, it rose 0.4% and the reading for July was also revised to show a 0.4% rise instead of 0.1% reported initially. With industrial output in June also rising more robustly at 1.0%, it has been a good summer for industrial production in the US. While US PPI and CPI inflation measures were weaker, they are unlikely to influence the Fed’s rate decision at the end of this month and possibly that in December – meaning the central bank still remains on course to hike two more times before the year is out. However, it may have some implications on future policy decisions if inflation and wage pressures were to remain stubbornly low. But could the dollar go down anyway? Well, the bears point to the fact other central banks are turning hawkish and that this could support foreign currencies in favour of the dollar. The warning yesterday from Mario Draghi that the ECB projects significantly stronger core inflation for the Eurozone may have been an early indication for a sooner-than-expected rate hike there. At the moment, the ECB expects to raise rates after the next summer, although QE is going to be tapered at the end of this month before being stopped at the end of the year. One way or another, monetary conditions are slowly tightening in the Eurozone. In the UK, the Bank of England has already raised rates and once a Brexit deal is reached we should see a few more hikes. The Bank of Canada has also started to raise rates and soon we could see the likes of the RBA and RBNZ joining the race. 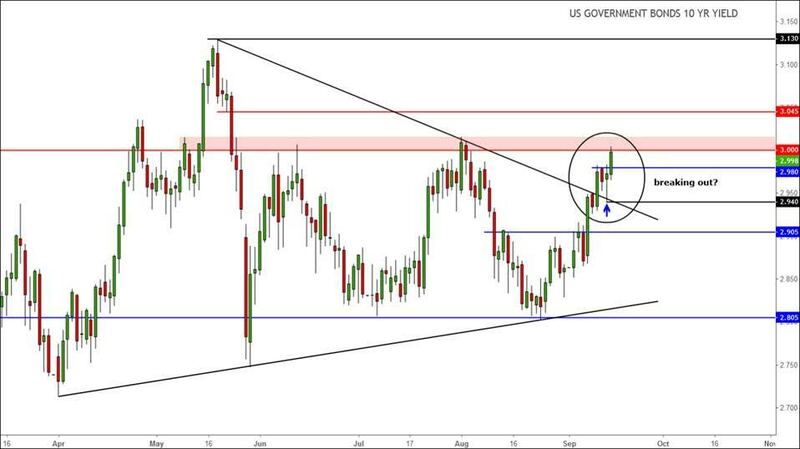 The dollar’s resilience could be because of the fact the 10-year US Treasury yields are on the rise and on the brink of a potential breakout above the key 3.00 hurdle. As can be seen, the yield has been making higher lows of late and the break outside of the converging trend lines suggests it could embark on another rally at least towards the most recent high at 3.13. If yields continue to rise, it is difficult to see how things like gold and silver will be able to cope, while it could also exacerbate the emerging market turmoil.